I just found this great blogger and am so excited to see such a simple and creative idea. 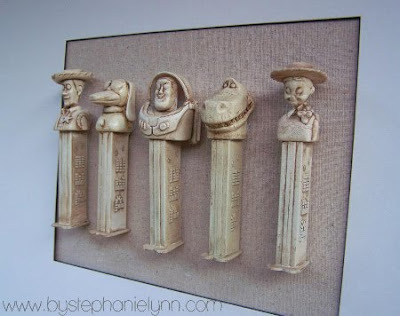 Dollar store Pez turn into neutral wall art. You could do this with a million different themes. Proof that you don't have to spend a lot to make your walls happy. She has instructions and photos on her blog so go check it out and make your kiddos or the kid in you a fun piece of wall art! That's such an interesting idea! I've never thought of that before! This is wonderful! Thank you for the pointer!